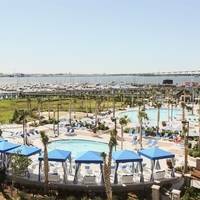 Palm Cove is located off the Intracoastal Waterway north of the McCormick Bascule Bridge (37-foot closed vertical clearance, restricted opening schedule) at ICW Mile 747.2, about 13 miles southeast of Jacksonville and 27 miles north of St. Augustine. From the ICW, pick up red daybeacon 2, which is located just north of flashing red ICW marker 32. Once you have picked up red daybeacon 2. set a course to the west to pick up red daybeacons 4, 6, 8, 10, and 12 into the Palm Cove basin, where the Palm Cove Marina lies. Depths in the approach channel range from three to five feet. 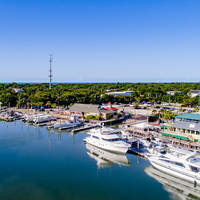 Palm Cove Marina is a fairly large facility and is located at a convenient spot between Jacksonville and St. Augustine. St. Augustine is about a four-hour journey south (slow 5-knot boats). The Palm Cove Marina accepts transient guests at its slips and also has gas and diesel fuel, and a lift for haul-outs and related repair services. No reviews yet! Be the first to write a review of Palm Cove Inlet.